PLANS for the next stages of the restoration of the Montgomery Canal take a further step this week. While the canal is being restored to Crickheath with the support of the Heritage Lottery Fund and Canal & River Trust, the Restore the Montgomery Canal! 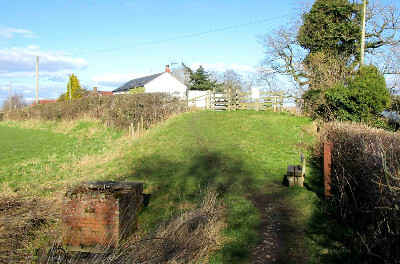 appeal has been promoting restoration of the last bridge blockage in Shropshire, Schoolhouse Bridge in Long Lane, between Crickheath and Pant. This week contractors will be conducting a ground investigation with boreholes to establish the soil conditions for the foundations of the new bridge. This information will enable the volunteer team working on the restoration and their professional consultants to finalise the design for approval by the highway and canal authorities to ensure the bridge meets the requirements for road and boat traffic. The appeal to raise funds for the new bridge is hoping for a boost with Local Giving’s online Grow Your Tenner appeal which starts at 10am on Tuesday 11th December. For a limited time Local Giving will match six monthly donations and then the anonymous donor who is matching the amount raised by the Restore the Montgomery Canal! appeal will double that figure again. Donations can be made through the Local Giving website or through the link on www.RestoreTheMontgomeryCanal.uk . “Our ambition for the Montgomery Canal is to create an asset for the local community and for visitors to the area. The experience of other restorations shows that a revived canal enhances canalside properties, brings visitors and creates business opportunities as well as giving local residents an amenity for recreation and exercise. “Schoolhouse Bridge at Crickheath is the last bridge blockage in Shropshire. We have been raising funds to rebuild the bridge for over two years and our appeal is well on target with the support of a generous donor who is matching what we raise. Last summer our ‘Bridge The Gap’ appeal to help towards our target for the bridge was supported by television canal-boat celebrities Timothy West and Prunella Scales and met a generous response from near and far. which will provide matching funds for regular monthly donations. This opportunity starts at 10 o’clock on Tuesday 11th December and runs until the match funding runs out—which I think will be very soon, so we are encouraging supporters to sign up quickly! “As we have a generous donor supporting this fund-raising, we calculate that with Gift Aid, a monthly £10 donation through Local Giving—the cost of a weekly cup of coffee—will be worth over £400 for our appeal. That’s an opportunity that can’t be missed! “Our plans for the bridge have been developed with the assistance of volunteers experienced in bridge engineering. We think it could cost up to a million pounds for contractors to rebuild the bridge and that with volunteers we can carry out the work at a third of the cost. So we plan to bring in teams of volunteers who work on canal restorations across the country: they have the training and experience to use major items of equipment for a task like this. Then we shall use professionals for the bridge deck and road surface.